Songbook: The Badger Chapter is an update to the LOTRO plugin Songbook, originally made by Chiran. 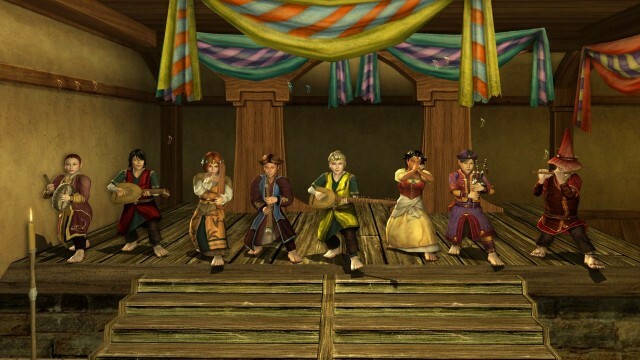 The original Songbook quickly became the “go to” tool for LOTRO musicians, since it made it much easier to play your ABC music files in LOTRO. It is particularly useful for playing together with others in a band. Chiran released his latest version, v0.92, in the summer of 2013. Back in 2014, The Brandy Badgers (one of the bands in the Grand Order) looked at new and novel ways to sort all the ABC music files we had prepared. Our folder structure was in danger of breaking down, and our song pack was getting somewhat bloated. 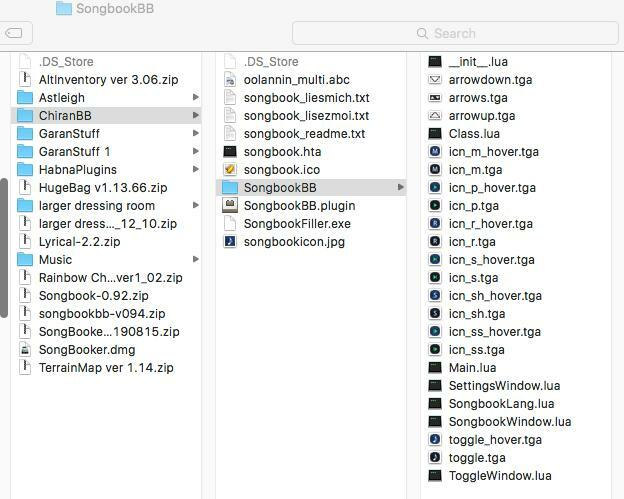 This is when Nimelia, our resident master of tools, offered to take a look at what we could do with the Songbook plugin, fixing some bugs and adding new features in the process. Songbook: The Badger Chapter is currently at v0.94, released January 2015. The Songtools (Songbooker and Songbrowser) was last updated 18. august 2015. There is a new beta version 0.95b of the plugin available here, if you want to experiment. Unzip the Songbook plugin zip file your “Documents/The Lord of the Rings Online/Plugins” folder. The Songtools files can be unzipped into and run from a folder anywhere on your computer. For more information on how to setup and use the plugins/tools, have a look in this Google document. Recommended song parts based on number of musicians: If tags added to the ABC file, you can now specify which parts of a song should be played when there is a specific numbers of musicians around. Song + part check: Are musicians on the correct song and part? Instrument check: Are musicians using the correct instrument? “Chief” mode: When the chief tick box is unchecked, this greys out the “playstart” button in Songbook so musicians don’t start the song by accident. Right-aligning of track names: If you would like to read the rightmost part of a track name, but the window is too narrow, you can now right-click into the tracks list, and the track names will temporarily be shown right-aligned. Right-click again, and the list will return to normal. Ready indicator column, displaying an extra one-character column in the players and parts lists, in addition to colouring (which was hard to read for folks with colour blindness). Extremely fast data filler which reads information about your abc files and makes this available for the Songbook plugin. Songbooker also reads and recommended filter information, so you can use those functions in Songbook. Allows you to tag your ABC files with filter and parts setup information. To load, type “/plugins load songbookbb” when logged into LOTRO, or use your favourite plugin manager. Please note that the Songbook window does not always show the first time you load the new plugin. To fix that, type “/songbookbb show” (or “/songbook show” if you use the patched version), and the window should pop up. Nimelia would love feedback on the plugin, both of what works and what does not. Please leave yer comments below. Please leave yer comments below! I have a problem with an abc. Now this is not your problem but it has highlighted a possible problem that may or may not be to do with Songbook. Right, missed this one, things have been busy. I’ll see if Nimelia can be put on the case! Do yer have the offending ABC? I’m happy we were able to help! As for the “note duration too long” error, Maestro sometimes struggles with long silences and lumps it into a chunk of code (for instance, z568/5) which is too long for LOTRO to handle. The trick to fix that is to locate those long silences, and either delete them (if at the end of a music track) or divide it into smaller chunks by dividing the number after the z by x, and then replace the original code with x lines of the new number. For instance, z568/5 can converted to two lines of z284/5 instead. A related error is “note too short”. One thing to try then is to reconvert the music file in Maestro, but reduce the main tempo somewhat. For instance, if a main tempo of 144 gives problems, try reducing it to 142 instead when reconverting and see if that works. That’s a bother. I’ll see if Nimelia has some insights, but first: let me try see if I understand what the problem is. First, when you say her music was gone, what does this mean? That SongbookBB couldn’t be loaded by LOTRO, or that it loaded but there was no music data in the plugin? (if it is the latter, try rescanning your ABC song data with the Songbooker datafiller – Songbook sometimes loses this info). I am guessing the actual ABC files were still installed on her PC? Did anything change on her computer between the rehearsal and the error? Were any LOTRO plugins updated? – Reinstall SongbookBB from the links above. – Install and run Songbooker (the data filler), so you’re sure that the music data is updated. As mentioned, I’ll show this to Nimelia, so she might have more suggestions. I was finally able to sort this issue by deleting the preferences.ini file in the Lotro folder in documents, and then logging into the game to allow it to reinitialize. Thrandili has her music back in time for the show – such a relief! I’d never want to be without SongbookBB. Hm, that sounds like a corrupted SongbookData.plugindata file. Did you perhaps load in new songs with the SongbookFiller (or the SongBooker) before it stopped working? If so, can you try remove the latest ABC files you added (just rename them to .abc_ or somet), and try running the data filler again? If it works then, there is a problem with one of the file names. In that case, check for non-standard characters, and quotes. Do you get a line number in the message? If so, check in the SongbookData.plugindata file (in \Documents\The Lord of the Rings Online\PluginData\\AllServers) and check what the file name before that line number is. Are you using the original SongbookFiller, or our SongBooker? The SongBooker can tolerate a few more issues (like double quotes in filenames) – I dimly remember adding that a while ago. Let us know if it still doesn’t work, we can meet in-game to try figure it out. I also want to thank you both for your detailed replies! I tried everything you suggested and was really at my wit’s end by this morning, but for future problems the band might have I’ve copied all your information in case it is helpful for another difficulty. \Plugins\ChiranBB\SongbookBB\SongbookWindow.lua:43: Unable to parse file! Good to hear that yer managed to sort it out! Aye, those .ini files might play havoc with things from time to time. Never heard it impacting on Songbook before, but that’s a good thing to know. Hullos there :) Many people asked me about the 5 new fiddles added to songbook :D Is there an update planned ? An update is planned, but still no ETA. Real lives are currently busy. Any issue with the “parts” not being accurately labeled within songbook? I have several song recently created with Maestro and within it stated “%%part-name Theorbo” yet when in game or even the ABC player all parts revert to the Lute of the Ages. Help? I don’t think it is a Songbook issue, but rather a tagging issue from when the file was created in Maestro. The only times I have seen this happen in ABC player is when the song title includes the name of an instrument. Example: If the song title is “Song for Lute”, that’ll override any other instrument assignments. Just seen change to /music (why SSG), does this break Songbook? The music on/off/true/false thing? I think they are optional parameters, and if so things should work still. But if we don’t tell Nimelia they’re optional, perhaps we can trick her into updating the plugin with all the changes we want? …Plugins/ChiranBB/SongbookBB/SongbookWindow.lua:43: Unable to parse file! Hello Pen’. Did you have made the songbookdata file needs to feed the songbook with the SongbookFiller.exe ? Pardon this question, truly, but I don’t know what you mean by “Did you have made the songbookdata file needs to feed the songbook with the SongbookFiller.exe ?” Can you word your question a different way? I downloaded it and followed the instructions, or thought I did it right. I’ve got ChiranBB folder in Plugins. Songbook needs a file with data about all the ABC songs you have in your music folder. The error message you got indicates that there is something wrong with the data file, or that it is missing. Okay after a few months of fiddling… The problem I was having was that the application you pointed out wasn’t working on my mac. Every solution that someone was giving me was not a solution for me. Kept getting odd errors. I finally figured out why. I formatted my new SSD to be case sensitive and apparently that messes up apps in odd ways. While most of the OS was fine and most of my apps fine, I just kept running into little issues. Or having to find files and rename them to what the application wanted. So if an App wanted to access a file named “Janes_Files” and it was “janes_files” I’d have to correct the case of J and F. Yeah, it was a silly error on my part to format my drive that way, but I rebuilt it, and many of the little problems that weren’t working have gone. Songbook finally works. NOW…. I need an ABC file editor that works on a MAC! Aha! Aye, that’s a particular error and then some. Good to hear yer managed to sort it out! I don’t off the top of my head know any ABC file editors that work on a Mac, but I’ll ask around. Much appreciated if you can think of something. “Maestro is written in Java so it should work on Mac, although I haven’t tried it myself. Download the .zip file instead of the .msi, then unzip it and run Maestro.jar using Java. You shouldn’t need to use Wine. The player installed JAVA and instead of the .exe file, ran the .jar file. And apparently it worked.